It’s not clear if Harper was kidding or not with his story, but it certainly captured the imagination of the country. By October 1969, the Beatles press office was flooded with questions about Paul’s health, and on October 12, 1969, DJ Russ Gibb of WKNR-FM in Detroit, Michigan moderated a full hour of an impromptu discussion of the topic with listeners who were calling in. Inspired, Fred LaBour, a University of Michigan natural resources student and reporter with its student newspaper, Michigan Today, who was assigned to review the recently released Abbey Road, penned a satirical piece titled McCartney Dead; New Evidence Brought to Light on October 14, 1969. Unfortunately, many people failed to realize he was kidding. LaBour also claimed that letters on Paul’s black arm band from Sgt. Pepper’s, OPD, stood for the British equivalent of DOA (and meant “Officially Pronounced Dead”), and that Paul’s bare feet on the Abbey Road cover signified that he was a corpse. LaBour also noted that Paul was smoking right-handed, a sure sign that this was an imposter. Within a week, the rumor, which now contained several of LaBour’s fabrications, had reached the national media. On October 21, 1969, the story was examined on New York’s WABC which was picked up (at least at that time) in 38 states. By now, the alleged crash was claimed to have occurred on November 9, 1966, after Paul had angrily left a Beatles recording session. In addition, at some point, rather than William Campbell, some people were saying “Billy Shears,” was Paul’s replacement, due to the lyric in Sgt. Pepper’s. Although the Beatles’ press office continued to deny the rumor as “a load of rubbish,” for many the rumor lived on, even after Paul did an interview with Life on November 7, 1969. It all worked out for Paul and the Beatles though, as a result of the rumor, Beatles’ albums sales increased significantly and both Magical Mystery Tour and Sgt. Pepper’s re-entered Billboard’s top album charts. At the end of November 1969, LaBour participated in a “cross-examination,” televised on New York’s WOR, that was hosted by F. Lee Bailey and which analyzed the rumor. When LaBour admitted to Bailey before the show that he had made up his “facts,” Bailey reportedly said, “We have an hour of television to do; you’re going to have to go along.” So, he did. Is Beatle Paul McCartney Dead? I was 10 when all the hubbub about Paul’s alleged death hit the news. I, like a lot of Beatle fans, hung on every report, rumor, and denial about his demise. I remember that Life issue that came out (wish I had kept it!). Other “facts” that helped the rumor out from the Abbey Road cover were John wearing white signifying a priest or minister (someone who presided over the funeral/burial), Ringo dressed respectively as a person mourning and George dressed down as a worker (a grave-digger). But the clue that grabbed most attention was the VW bug with the license plate “28 IF” which would have been Paul’s age IF he had lived; according to the rumor. A VW Bug with that license plate has made appearances in many photo shoots and movies (‘The Parent Trap’ from 1998 had it, I think). So many fun facts regarding this rumor! Great article. Thanks. Let’s not forget about strawberry Fields. At the very end of the song you can here John say Paul is dead. You have to turn the bass down and treble up and be in a quiet setting to hear it. It says or is supposed to say “I buried Paul”, not Paul is dead. I think you’re referring to where John supposedly says “I buried Paul”. If you listen to another mix on Beatles Anthology 2, you can more clearly hear that he’s saying “Cranberry Sauce” slowly, in a strange voice. I believe if you play the record of Strawberry Fields backwards, at the end you hear someone say “I bury Paul”. The article mentions the walrus in the “Glass Onion” song, but neglects to point out that the only reason John would mention any “clue” was to feed the frenzy that already existed. And, since the White Album came out in 1968, it stands to reason that people were looking for clues long before October, 1969. Back in 1969, when this story was everywhere, my cousin and I were totally freaked out by playing “Revolution Number Nine” backwards to apparently hear John saying, “Turn me on, dead man.” I still can’t listen to that song (which, because it’s one of John and Yoko’s experimental pieces, is no great loss). good, you keep believing that. baaaaa….. The black arm band doesn’t even say OPD, it says O.P.P. it’s for the Ontario Provincial Police. This article is a continuation of the attempt to put the rumor to rest. What I’ve learned in my long life is this; if a rumor persists and reappears over a long period of time, the rumor very likely is true. There have been comprehensive cranial comparisons by experts in the field and the results prove without any doubt whatsoever that the guy claiming to be Paul Mccartney today isn’t the real Paul Mccartney. The real Paul McCartney died in 1966. Just look at the first pictures of ‘Paul’ from 1967; they don’t resemble the real Paul in the least. The replacement wore a fake moustache to conceal surgical scars , he had numerous plastic surgeries to make him look as much like the real Paul as possible. Look at the pictures of the current Paul. None of his features match the real Paul McCartney. Sorry but it’s a fact that today’s ‘Paul’ isn’t Paul McCartney. His death explains the abrupt announcement the following day that the Beatles were not touring anymore. It also explains why ‘Paul’ had no emotions or reaction at all when a reporter asked him about the murder of John Lennon on that very day. 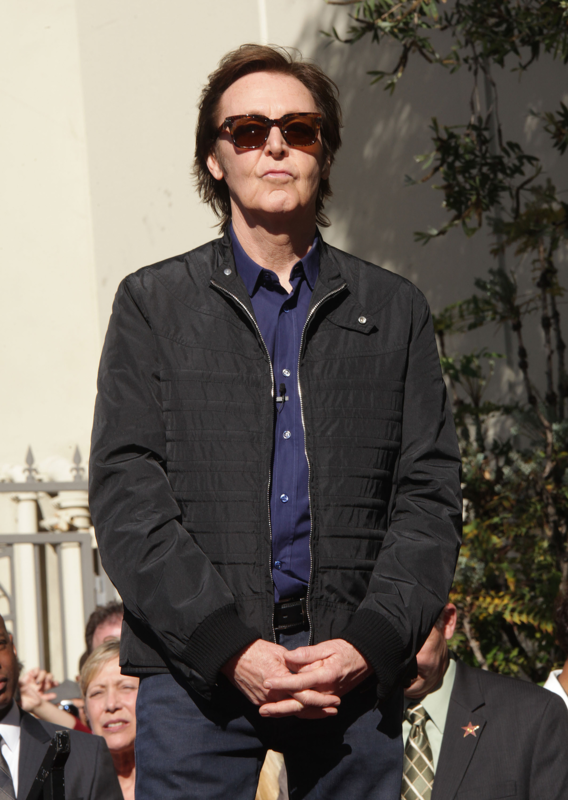 ‘Paul’s’ response to the reporter was, ‘ it’s a bummer isn’t it’. It also explains why Heather Mills’ life was threatened when she was divorcing ‘Paul’, and why she said on a television talk show,’ if you top me off ( kill me)the box filled with all that I know will go to a friend and all will be exposed anyway. She added,’ if the people knew the truth about things they wouldn’t be able to handle it,….that’s how big this is’. What could be so ‘big’ that the public couldn’t handle it? i agree on all of the above. Very good point about Heather Mills, and the information she had in her possession. I used to put the “Paul dead” rumors aside, ‘Paul’ said it was a gimmick to sell records. But it always bothered me deeply. Why would they perpetuate and continue a vicious story line like that? the demise of their brother, friend, band member? And then Stella McCartney was born. She simply does not look like either family , McCartney or Eastman. Please see my post regarding facial characteristics (eyelids and eye socket) proving that Paul most certainly did not die in 1966. Absolute trash perpetuated by a bunch of PID wassocks and smegheads. Ringo Starr is also Left Handed, he just play’s a Drum Kit set up like for a right handed Drummer. It is easily proved that the current Paul is the same as pre 1966 Paul. If you look at photos of a young Paul, even a number of years before 1966 when he was very young, you will see that his left eyelid is substantially narrower than his right. In post 1966 photos his left eyelid appears exactly the same and has looked like this all through the years, up until the present time. This is something that would have been extremely difficult to copy with plastic surgery. Something that I have not seen mentioned anywhere else, is that if you look closely at pre 1966 photos, you can see that Paul’s left eye is positioned slightly lower on his face. The actual eye socket is positioned slightly lower in his skull. This curious feature cannot be determined if his head is turned to the side, but can be quite easily detected when he is looking straight at the camera. Once again, this feature can be determined in photos during the ’70’s, 80’s and up until today. Of course there is absolutely no way that a slightly off-set eye socket could have been replicated by means of plastic surgery. So there you have it – two unusual features which can be found on both pre 1966 and post 1966 Paul, proving once and for all that Paul McCartney most definitely did not die in 1966.